hakucho: Better late than never! This post is long overdue. I wouldn't blame you if you have given up on me with my neglectful behavior. Mostly I just have not felt like blogging - - reading or writing. I find myself in a funk so to speak. This funk I'm ashamed to tell you has also included my knitting. There have been many a night that I couldn't even pick up my knitting needles. Not good, not me. I'm never not knitting. I love to knit. 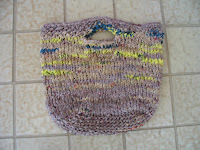 Almost a month ago I manage to finish a bag that I was knitting. It took forever to knit. I was really sick of it by the time I finished it. I like how it came out, but I made a big "boo boo" in the placement of the handles. I guess I didn't think it through enough before I started. It works, it's usable, but the handles are wrong, so wrong. I thought for about 3 minutes about ripping out the handle before talking myself out of it. I know I should, but I just can't psych myself into doing it. It's only a bag, shopping bag after all. If and when I ever make another one, I'll do the handles the right way. We'll just have to see how much I like using the bag. I think it will be a good one. The knitted cotton fabric is nice and dense, and not stretchy, so I think it will work out well. Time will tell. I haven't even been doing much in the way of baking since Easter. Yesterday I made a Swedish Coffee Ring. I've had a package of almond paste in my cupboard too long. It has been staring at me so long that I finally decided to put it out of it's misery. You see, there was a slight problem with it. I had it so long that it had hardened. The package never opened - hardened. When I say hardened I mean it turned to cement...you know hard as a brick, hard! The stuff is expensive so I didn't want to throw it out. I hate to waste food. I did some research and found that almond paste rarely goes bad. The sugar content keeps it from going rancid. I found out that you can grate it. I grated it. All I ended up with was dust and it was going to take forever. I tasted it, thankfully it wasn't rancid. I didn't put it in my food processor for fear of breaking it. It was that hard. Back to the computer for more research. (What did we ever do without google?) This time I tried microwaving it wrapped in a damp paper towel. I tried 30 sec. and found it was softening. Put it back in for another 30 sec. and voila ....it worked. If I was smart this would have been the time to have pulled out my food processor to break it up, instead I used my hands and now I have two burned thumbs with blisters...stupid me! To make the filling I melted the butter and cooked the almond paste in the butter with the brown sugar to soften it more. Then I cooled it before using the filling. It worked out great and we had a delicious coffee cake. Believe it or not...it's all gone. Every last crumb!! My newest orchid - the mini phal is doing great. It's in FULL bloom and it's gorgeous. I just love it. My other new one this year, the dendrobium is also in full bloom. It's doing well, too. Absolutely love orchids. I love how they bloom such a long time. They are well worth their cost. Miss Pink is getting another new leaf. She seems happy, even though she's not flowering yet. I made a lemon meringue pie for our Easter dinner this year. I had 3 Meyer lemons left over from the pie I had made earlier. I was quite surprised to find over 30 seeds in those 3 little lemons. I decided to plant the seeds and see if I could grow my own Meyer lemon tree. It took just about 4 weeks for the spouting to begin. Now I have a bunch of little seedlings to watch. Here you can see the biggest of the bunch. I'll have to transplant it soon into it's very own pot. How cool is that? I did a little research and found it takes about 8 years for it to produce lemons. Won't it be fun watching it grow? Now that I've got you up to speed with what I've been up to, now it's my turn to get caught up with my blog reading. I really think that's my problem. 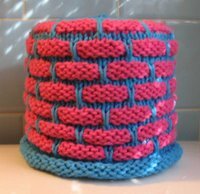 I need the inspiration that comes from reading knitting blogs. Can't make any promises, but I hope to be visiting you soon. I've never seen an orchid with so many blooms: it is gorgeous! I love the look of the bag. What is the problem with the handles? Too close together? Too long? That coffee cake looks delicious. Sorry you had to go through so much to make it. It seems like the lack of knitting mojo has been making the rounds. Hope it comes back for you. I could never give up on you ;-) You have been a part of my readings for a long time now. I think we all go through that funk. LOL I tend to have it more than most LOL. Love the flowers they are gorgeous! Your bag looks fine. I can't tell there is anything askew with the handles, but I know how you feel about finally finishing and then discovering there is a challenge with it. The coffee cake looks delicious! I'm not surprised that it is all gone! Your flowers are lovely. Those lemon sprouts are the cutest thing. I just discovered via pinterest that you can cut off the bottom of a celery bunch and it will grow celery - I have started two and one is growing. So cool to make new plants from the old!! You were missed. But this long chatty post filled with such beauties is worth the wait! Awww...we all go through slumps. Glad you're back! I can't believe your orchid, so lovely! You must have hit on just the right spot and care for it. Okay, I'm really jealous of your Meyer lemon sprout! I've been trying to find one of these lemons so I can try it for taste and then maybe grow one, too, but I haven't found them where I shop. Your bag looks great! 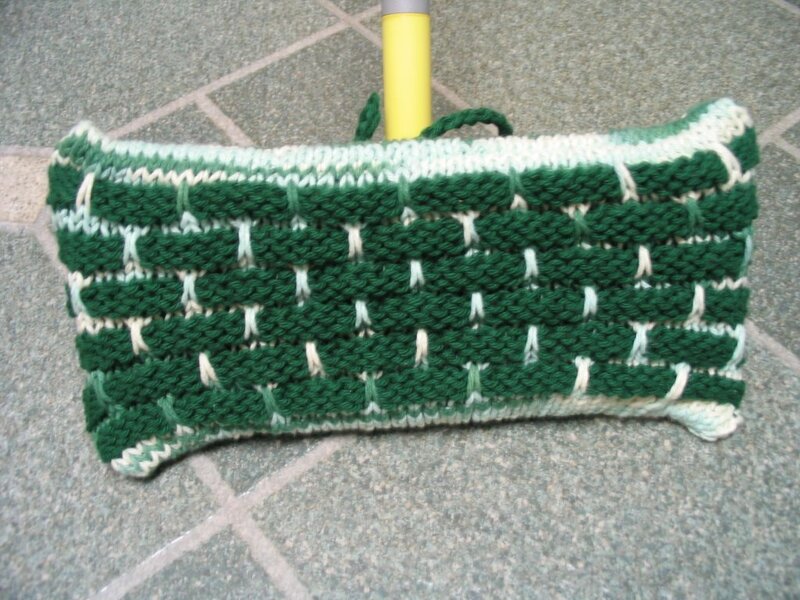 I also knitted one that has handles I don't care for, but I use it anyway. Hope you get your knitting want-to back soon. :) I'm still on a big break from it myself, but I think it will come when the fall winds blow cool air again. Glad to have you back! Looks like you've figured out how to grow orchids, that's for sure. How do you water them? I've slogging my way through the Holding Hands baby blanket; should've used your kind of yarn instead of DK as it's taking forever. Good thing it's not needed till September!Your coffee cake looks like it was very yummy....must have been if it's all gone. Take care. been in a knitting baking funk ! must be contageous! good luck with your lemon farm ! Your orchid looks amazing! So many flowers. It's just beautiful. I planted a citrus seed when I was pregnant with my daughter. I was eating an orange and found a seed and just stuck it into the potted plant beside me. When it germinated, I planted a few more seeds from other citrus fruits. One of them was very healthy. It grew and grew. When we built our solarium, it got a place of honour. But eventually it grew too big even for the solarium. It finally died one very hot summer. I'm not sure what kind of fruit it was, but it had long thorns on it. Your knitting looks good. 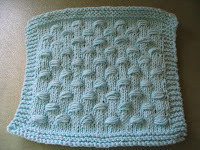 I have started a new crochet pattern for the summer. I've been there too. Too many things going on in my life that I can't chat about or want to online so since I have nothing good to say, I've been relatively quiet. I should really blog about something now and again in case any one does pop over.